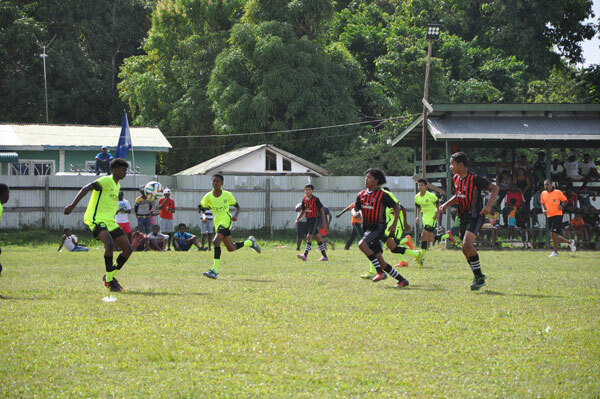 Shoran James banged in a hat-trick against Swan FC to lead Herstelling Raiders to their second win in three matches when the East Bank Football Association (EBFA) leg of the GFF/Pele Alumini Frank Watson U15 Intra Association League continued with day four action yesterday at the Grove Playfield. The diminutive forward has now scored a total of 11 goals in three matches as they temporarily hold down the number two spot on the points table ahead of Agricola (both on 6 points) with a better goal difference of +13 to +3, Herstelling playing one more. Grove maintained their hold at the top after surviving against Samatta Point/Kaneville in their 1-1 draw. On the day, there were also wins for Kuru Kururu Warriors which needled Timehri Panthers, while Friendship All Stars trounced Soesdyke Falcons 4-1. Friendship and Kuru Kururu Warriors notched their first points of the league which will continue today with four more matches at the same venue form 09:30hrs when Grove match skills with Mocha Champs to be followed by Agricola playing Diamond United from 11:00hrs. Herstelling Raiders will then oppose Diamond Upsetters from 12:30hrs with the main event of the day between Samatta Point/Kaneville and Soesdyke Falcons. The feature game of the day turned out to be the shoran James show, his skills and agility being too much for Swan to handle. The Linden Soesdyke Highway (LSH) based side contesting their first tournament on the East Bank had needled Timehri in their debut match one week ago and were confident of taking down another of the seasoned teams but James would have none of that. They kept Raiders at bay for almost the entire half but finally cracked when James dribbled two defenders before banging the ball into the back of the nets in the 31st minute to break the deadlock. Swan continued to be a tough proposition for the Raiders in the second half but it was James whose magic doubled the advantage for his team in the 46th minute and tripled same in the 58th minute. Swan were able to pull one back in the 61st minute but lost the battle, 3-1. The third match of the day saw Kuru Kururu Warriors, the other Highway based side that lost in their first two matches to Grove and Swan respectively rebounding to record their first points when they needled Timehri Panthers which had won their first match of the league against Soesdyke. The first half was a goalless affair and it took a penalty in the second half to separate the two sides. Kevon Scott who was brought down in the area was the player to drill the shot past Ronaldo Blair in goal for the Panthers who muffed numerous chances during the match. Friendship also eased into the point’s zone with a comfortable win over Soesdyke Falcons, 4-1. Marlon Dey opened the scoring for Friendship in the 11th minute but that advantage was cancelled out in the 20th minute through a goal from Tyrone Burnette for Soesdyke. Three unanswered goals from Alvin Heralall (49), Dey again in the 64th and Jaime France in the 68th minutes confirmed Friendship’s 4-1 win which has taken them to the eight position in the 12-team league, just ahead of the Warriors; five teams are on 3-points with Samatta Point on 4 in fourth place. Yesterday’s opening clash between Grove Hi Tech, the current leaders and Samatta Point/Kaneville ended 1-1 with Samatta Point creating the most opportunities. Ray Richards netted for Samatta Point, while hi Tech’s Captain Devon Padmore converted for his team. Another epic day of action is anticipated today.